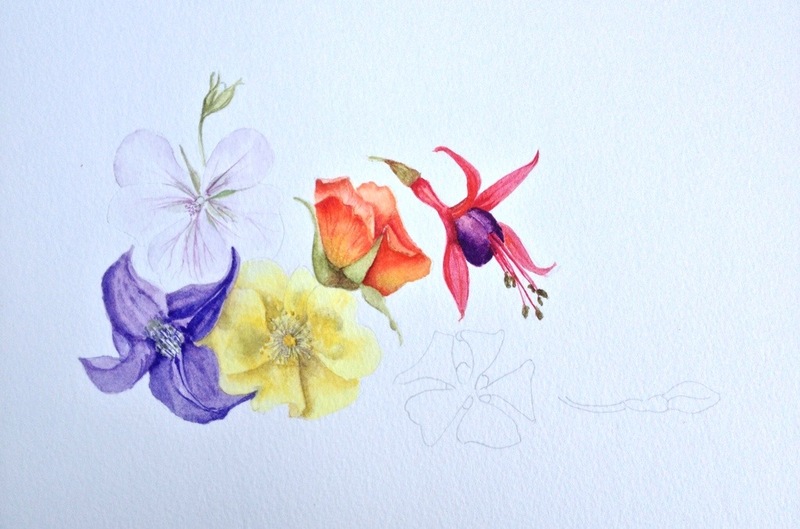 Botanical art workshop today – demo tomorrow. The last day of this workshop was today. The sun shone for most of the say and obviously affected positively everyone in the room. The workshop went well. The students seemed to be satisfied with both some of the things they had learnt, as well as what they achieved. To top it all we had a lot of fun. There seemed to be longish periods of almost silence, interspersed with hilarity. A good workshop from the point of view of the tutor (me), but in the end everything depends on what the students got out of it. Have a look at some of the results. The next workshop is Tuesday 17th until Thursday 19th June and is all about beautiful roses. How difficult can they be? Not so difficult once you are given tips in what to look for in your subject; and how to translate this onto your paper. Do get in touch if you can join me. But tomorrow I will be demonstrating at the Oxmarket Art Centre, for the Society of Floral Painters (SFP). This time I will be demonstrating watercolour. Over the last three days whilst discussing composition and drawing, I started off my composition as an example for the students today and for the demo tomorrow. My next picture has taken three evenings to draw. It is a Mandeville plant. It is quite a complex composition because of the growing habit of the plant – which needs to be shown. My students from the last few days all wanted to come back to Chichester to see the demo, but unfortunately live too far away to be able to drop in. I promised that I would use the blog to show them how the picture develops. 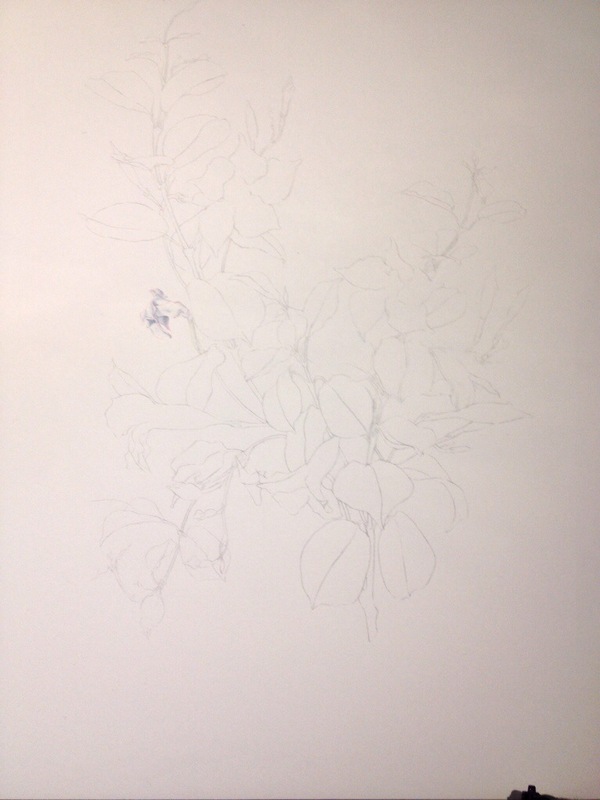 These are the the first two photos, but I am not sure whether you will see clearly enough the drawing in the first one. 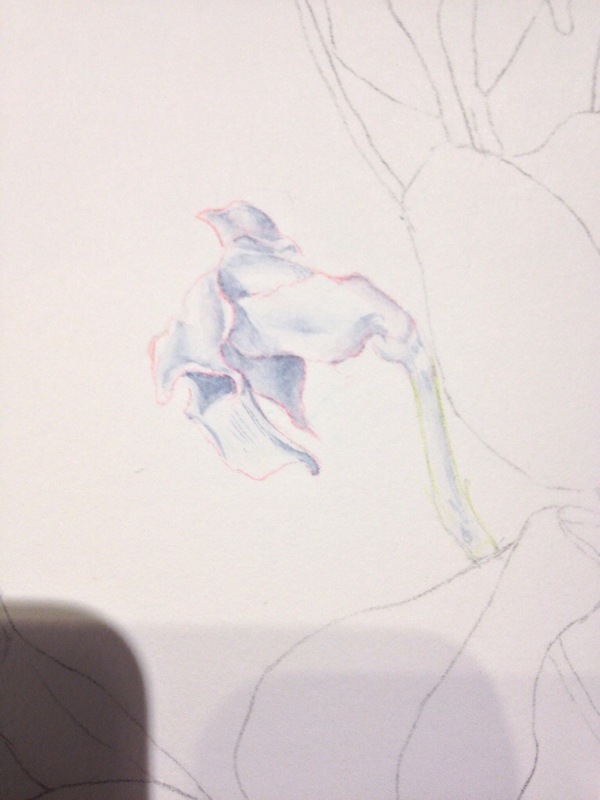 The second shot is the tonal under painting of a dying flower. Hopefully one of the many buds will open tomorrow so that I can do one of the spectacular flowers. Come and see the demo at the Oxmarket, Chichester 11:00 – 16:30. 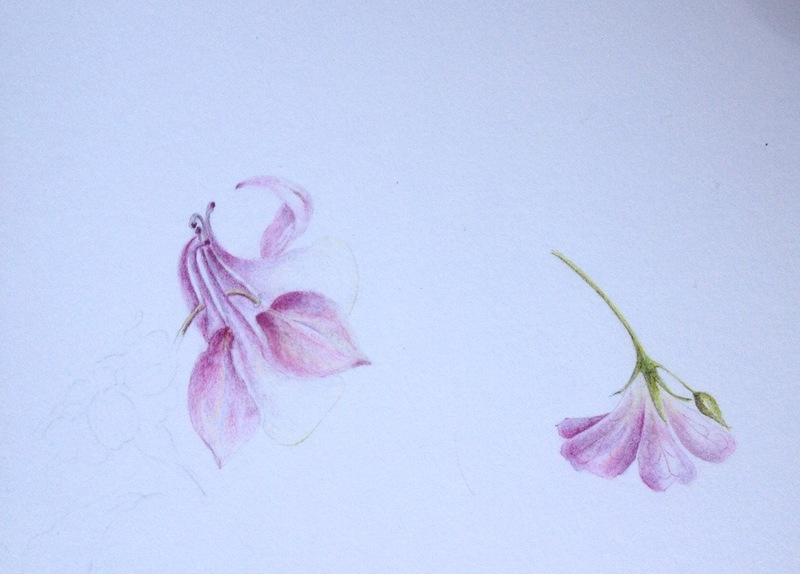 < What isn’t happening in botanical art at the moment? Thank you Sarah. I enjoyed it very much too.